There are a lot of good reasons to consider concrete patios for backyard pool areas and other recreational areas. Even if you gravitate toward patio designs that seem to lend themselves more to tile or paving stone, you should give concrete patios some consideration. Quite often, they can give you the same elegant results that you have in mind for tile or paving stone at a much lower cost for installation and maintenance. If you have your heart set on a tile pattern or paving stone pattern, one of the patio ideas you may want to entertain is getting imprinted concrete instead. Imprinted concrete can be provided with sophisticated designs that match the surfaces that people tend to gravitate toward when they’re considering spending a lot of money on their patio. Concrete patios are more durable than most of the materials that actually cost more than concrete. This means that, in many cases, imprinted concrete will give you the appearance of tile without any of the drawbacks. The same applies to paving stone. Among the drawbacks to tile and paving stone surfaces that concrete patios tend to mitigate are the ones that have to do with comfort. With tile or paving stone, you will eventually get uneven surfaces and gaps that were not part of the original layout of the surface. Concrete patios don’t do this. When concrete patios do have issues that need repair, it is very easy to fix them in the vast majority of cases. Imprinted concrete requires far less maintenance than do tile and most other surfaces and it stays even. 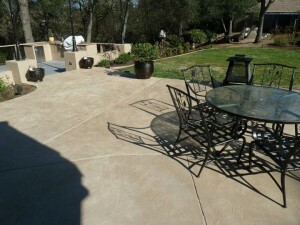 Sierra Concrete Resurfacing provides concrete patios for Sacramento and Bay Area residences. If you’re interested in improving your outdoor recreation area and want to make sure that you get a very safe surface with very low maintenance costs, look at some of the patio designs that employ imprinted concrete and other concrete options.